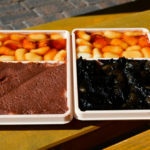 In Japan, Drift ice appears only from January to March, and can be enjoyed only along the Sea of Okhotsk and a part of Pacific Ocean. 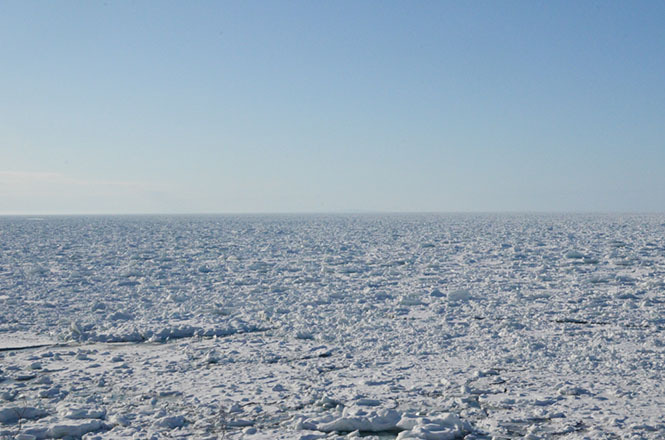 The sea is covered with the drift ice from the shoreline of Monbetsu to Shiretoko Peninsula, and it is amazing view! It may be said that you must see the amazing view once. 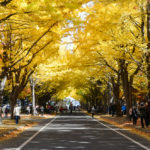 Hokkaido has 3 towns called "Monbetsu", Monbetsu (紋別) along the sea of the Okhotsk, Date Monbetsu (伊達紋別) along the Pacific Ocean and Monbetsu (門別) along the Pacific Ocean. 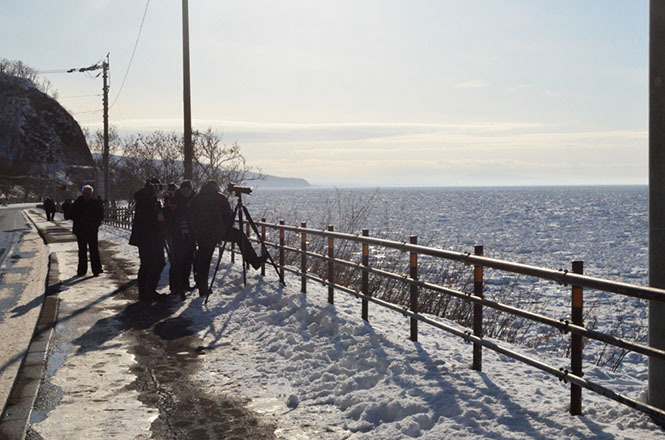 In those Monbetsu, a place to view the drift ice is the Monbetsu (紋別) along the sea of the Okhotsk, and the Monbetsu, Abashiri (網走), Koshimizu (小清水), Shari (斜里) and Rausu (羅臼) have some drift ice spots. 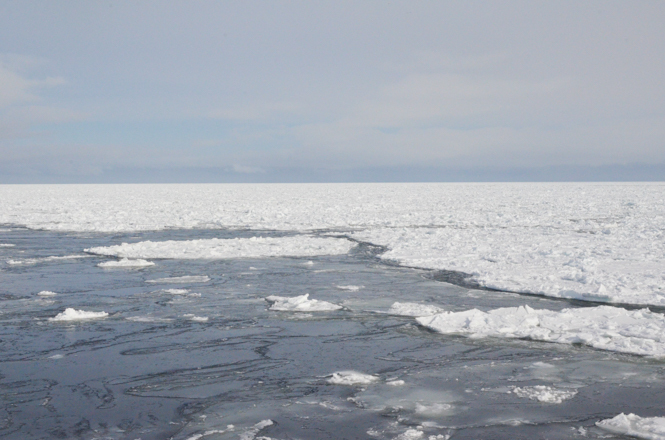 Tourists can enjoy the drift ice on the shore, and also enjoy it as the drift ice cruise on the sea. Unfortunately, global warming cause decreasing the drift ice recently, but you may see wild animals such as Earless Seal and Steller's Sea-eagle on the drift ice if you are lucky. 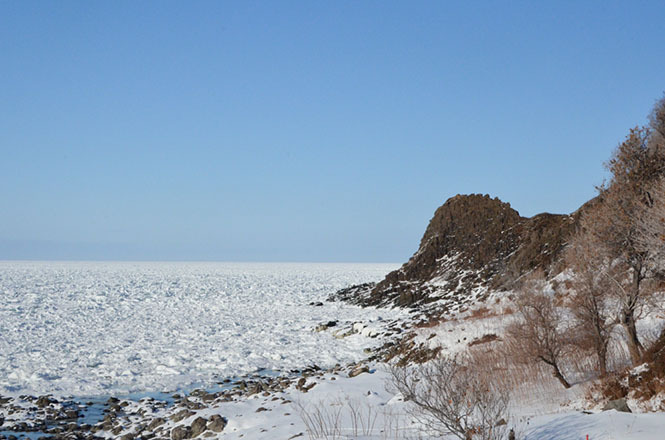 As for the drift ice, a cold front with a low of -40 degrees celsius blows from Siberia to Hokkaido in a winter, and ice born in Amur River is drifted to the Sea of the Okhotsk by the wind. 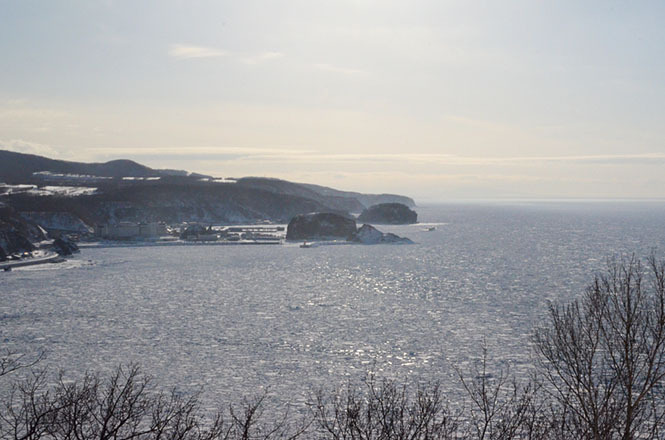 Shiretoko Peninsula just plays a role as the net, and the sea is covered with the drift ice closely from the offing Of Abashiri to the Shiretoko peninsula. I thought that all the drift ice was born in Russia. 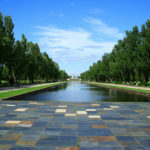 But a chief engineer of the Garinko-go2 said "The water of the Amur River flows into the Sea of the Okhotsk, and seawater keeps on separating from freshwater for a period of time, and the concentration of salt in a part of freshwater lowers. 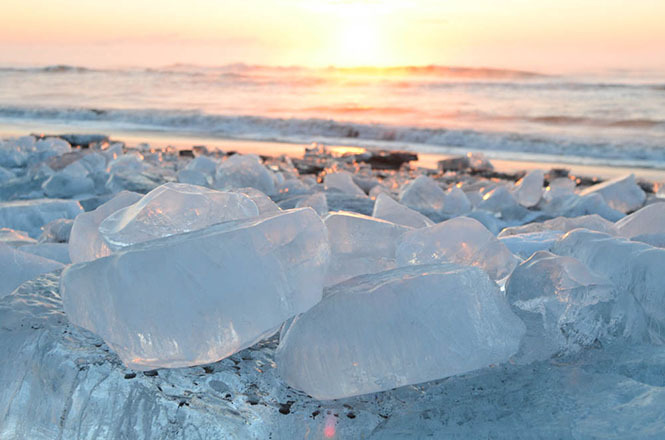 Therefore, the seawater of the Sea of the Okhotsk freezes at -1.8 degrees celsius, and the drift ice forms ice in the Okhotsk". 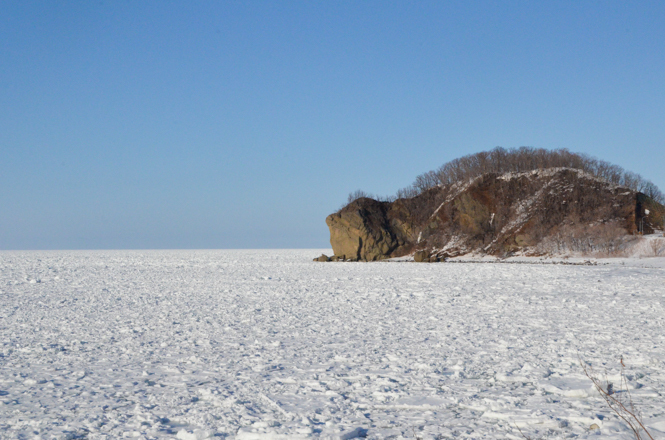 Around the Sea of the Okhotsk, frozen river ice in the Amur River, Russia can be enjoyed, and frozen river ice in Tokachi River (十勝川), Japan can be enjoyed as well as the drift ice, too. It is Toyokoro (豊頃) facing Pacific Ocean. 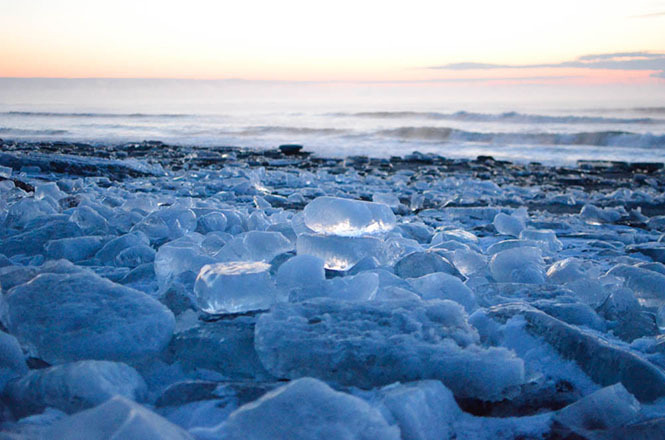 The river ice called "Jewelry Ice" is washed ashore on the sandy beach, and become a popular tourist attraction as a photogenic place. States of the ice are difference, and the drift ice looks whitish, and the Jewelry Ice looks clear. It is the same as the river ice, and I wonder why those were different. 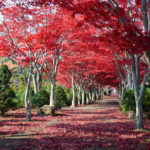 Maybe it is mystery of nature. 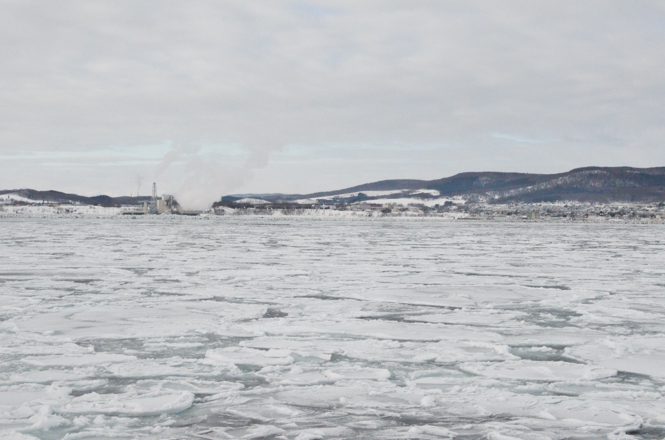 Drift ice cruise is held in the Abashiri, the Monbetsu and the Rausu. 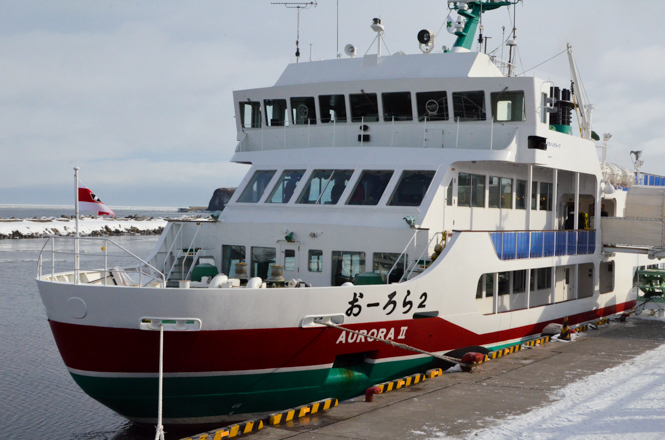 In the Abashiri and the Monbetsu, the tourists can take part in the drift ice cruise on relatively large ships, and the tourists can take a leisure boat in the Rausu. 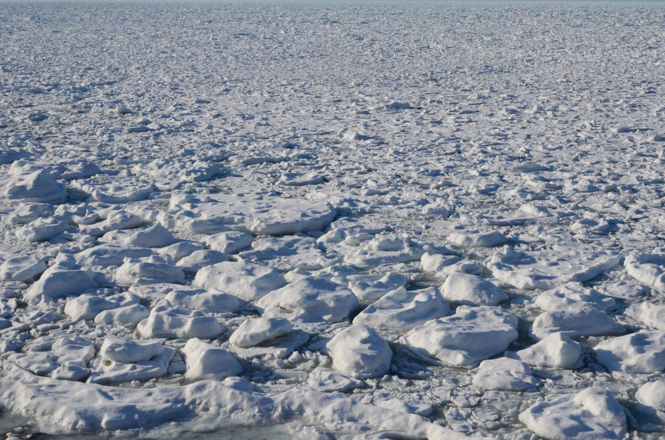 As for the Rausu side, the tourists must wait till the drift ice coming. By the way, the differences between Aurorago (おーろら号) and Garinkogo2 (ガリンコ号Ⅱ) are a method of breaking ice and a swing of the ships according to the size of the ship. But All the tourists have to do is take medication for motion sickness. 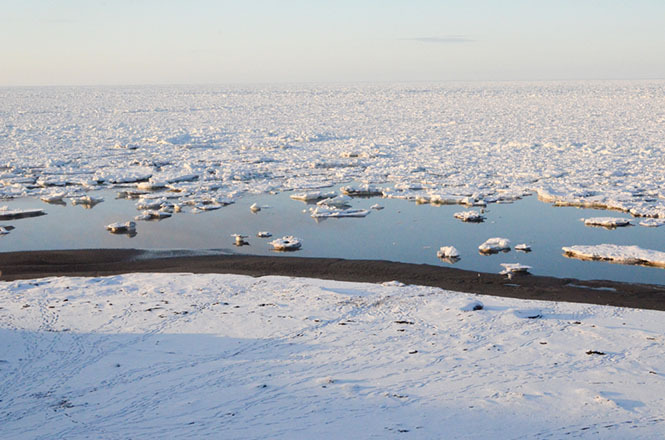 Some activity companies accept the drift ice cruise at the Rausu side that a port is hard to be covered with the drift ice. 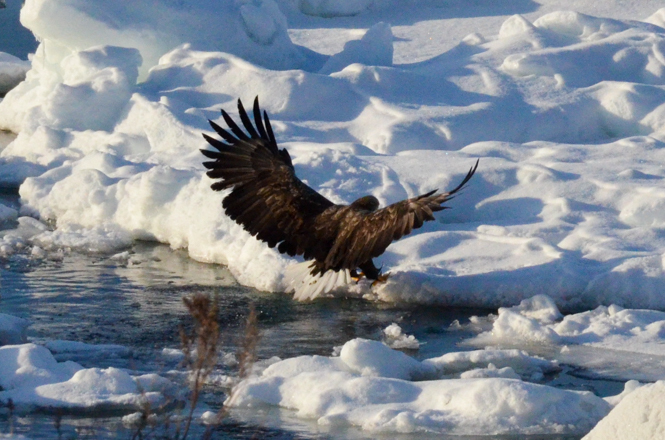 The activity is popular with photographers because the drift ice with the White-tailed Eagle, the Steller's Sea Eagle and Earless Seal can be taken a photo. 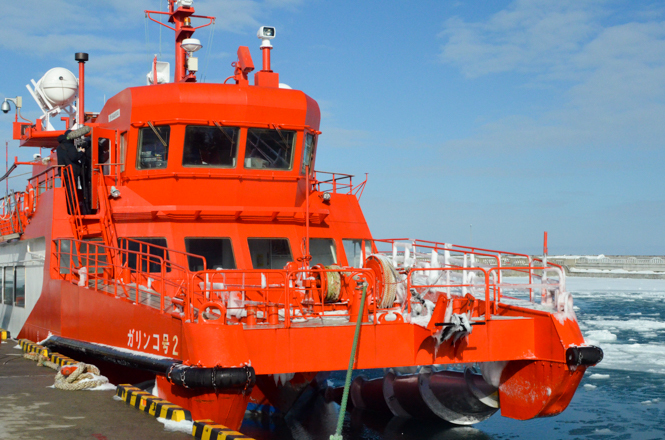 The tourists can take on a cruise ship, because the ship is not large, it may be powerful. 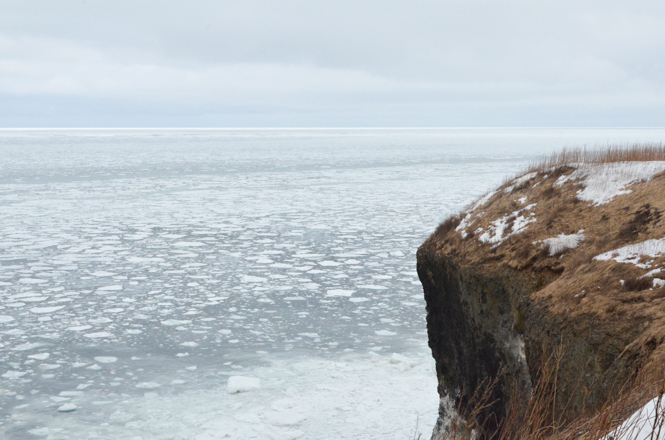 There are some viewing spots for the drift ice along the Okhotsk coast. 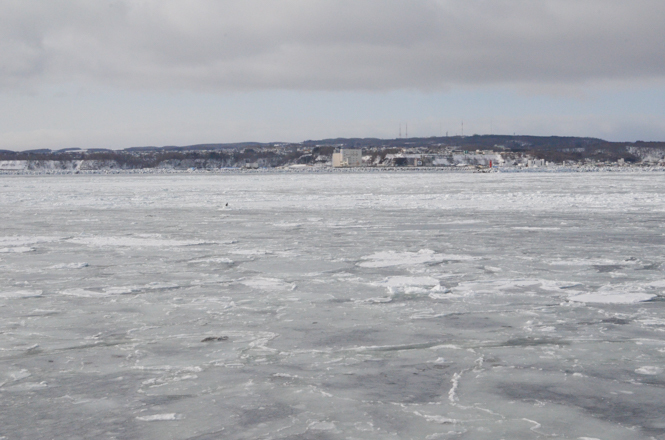 My visited viewing spots for the drift ice is as follows. Cape Chashikotsusaki (チャシコツ崎) is a small cape near Utoro, and Ainu people used to build a fort here. Rocks like a turtle is a mark on the way to the Utoro. 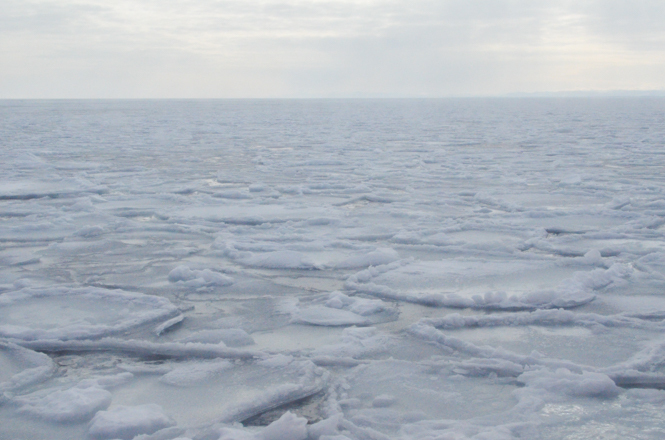 Its height is about 50 m. The turtle surrounded by the drift ice is worth seeing. There is not a facility. Admission free. A parking lot is free of charge. 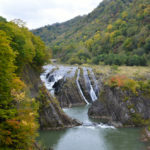 Oshinkoshin Falls (オシンコシンの滝) is a famous waterfall in Shari town, Shiretoko Peninsula. 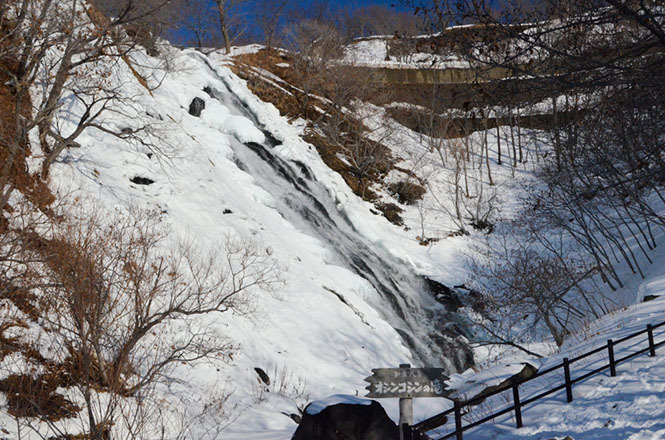 In a winter, the Oshinkoshin Falls is frozen, and a lot of the dirft ice come along the coast. 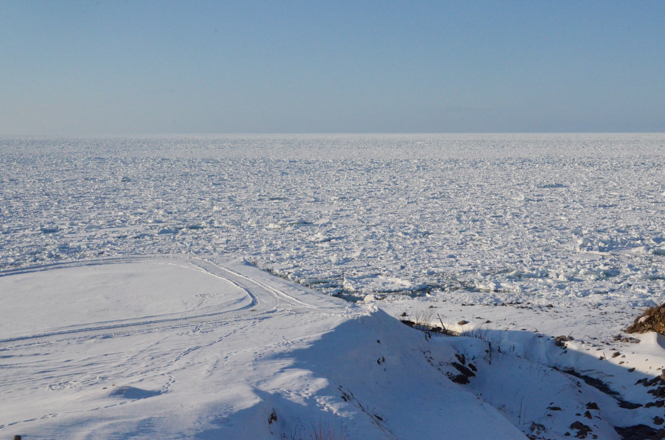 Visitors are moved by white world covered with the drift ice. Very nice view! A parking lot is provided near the Oshinkoshin Falls, so some tourists participating in group tours take a photo. A shop is closed during the winter season. Admission free. The parking lot is free of charge. 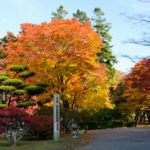 A site of Resthouse Chippudomari (レストハウス知布泊) in Hinode district, Shari town is open to public as Ryuhyio-tenbo-hiroba (流氷展望ひろば) from early February to mid March. 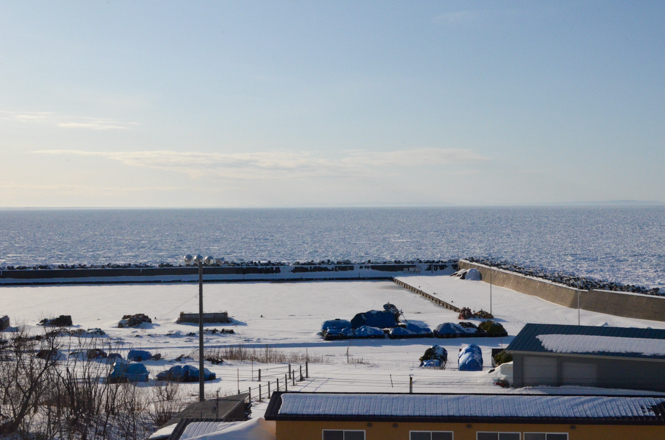 There is Chippudomari Fish Port under visitors's eyes, and a combination of the port and the drift ice can be enjoyed. There is not a facility except the Resthouse Chippudomari. Admission free. A parking lot is free of charge. 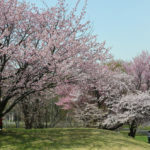 Masuura View Point Parking (鱒浦ビューポイントパーキング) is a parking lot near Masuura Fishing Port (鱒浦漁港) in the Abashiri. 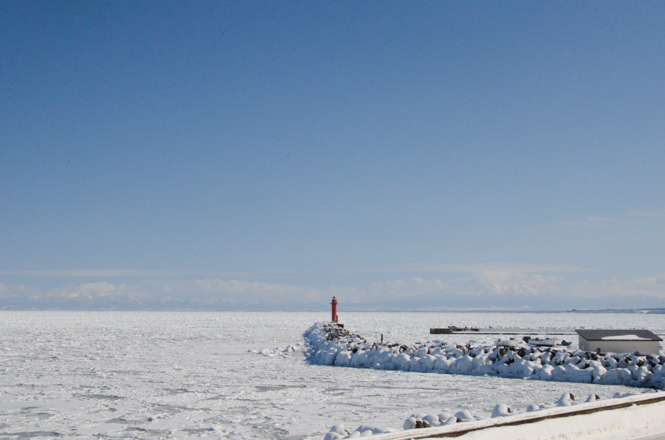 In the winter, the drift ice crowds, and a red lighthouse surrounded by the dift ice is very good. 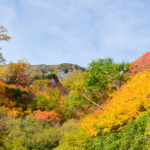 If it is fine weather, Shiretoko Mountain Range (知床連山) can be seen. There is not a facility. Admission free. A parking lot is not free of charge. Except my visited place, Cape Hinode (日の出岬 * La Luna) in Omu, Okhotsk Tower (オホーツクタワー) and Okhotsk Sky Tower (オホーツクスカイタワー) in the Monbetsu, Ryugudai Observation Deck (龍宮台展望台 * Ice Boom) in Yubetsu, Tentosan Observation Deck (天都山展望台) in the Abashiri, Furetoi Observation Deck (フレトイ展望台) in the Koshimizu, Furepe Falls (フレペの滝) in the Shari, Rausu Kunashiri Observation Deck (羅臼の羅臼国後展望塔) in the Rausu and Notsuke Peninsula (野付半島) in Bekkai are famous. 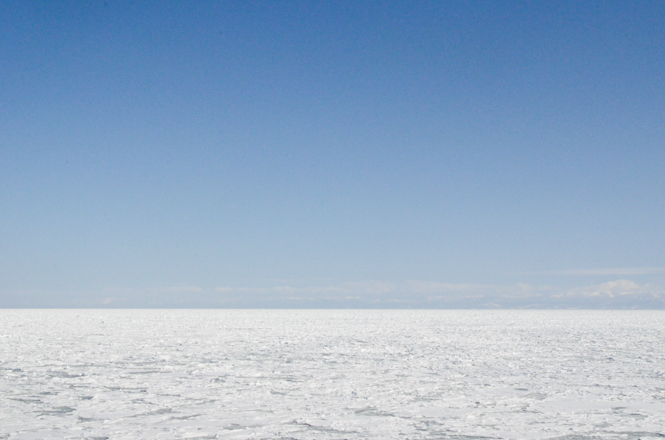 Speaking of drift ice activities, the drift ice cruise is most popular. 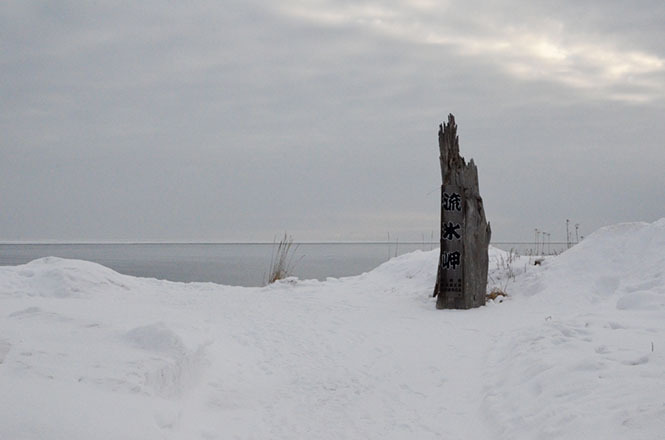 In addition, Drift Ice Walk is a special program of Shiretoko Peninsula tourism. 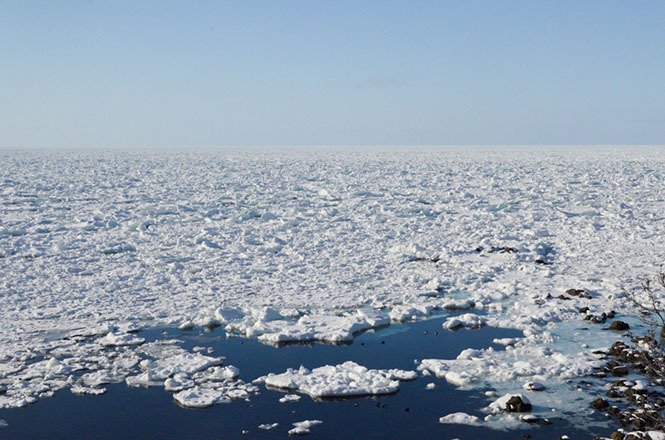 It is an activity playing the drift ice in wearing a dry suit in the sea of the Okhotsk. Tourists can enjoy an unusual enviroment with the seawater temperature 0 degrees celsius and unusual daily life. 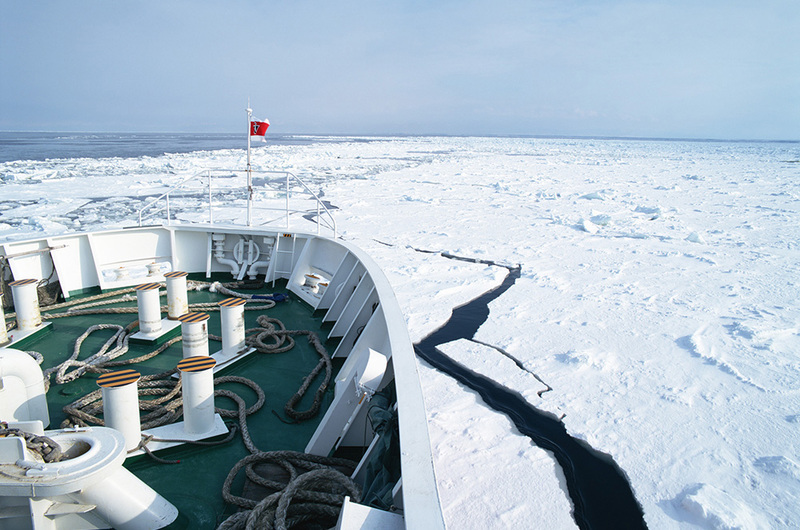 Some activity companies provide the drift ice cruise and the drift ice walk. Refer to following websites for the activity companies. You can get information regarding online reviews and photos. 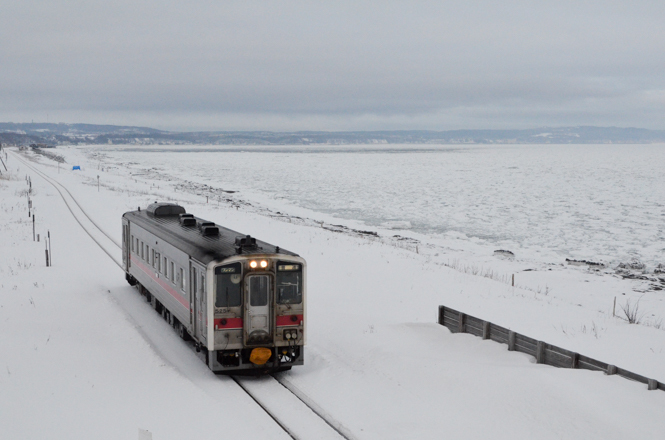 By the way, Drift Ice Sky Cruise is operated, too, and a special sightseeing train "Ryuhyo Monogatari Train (流氷物語号)" runs from the Abashiri Station to Sireto Shari Station. 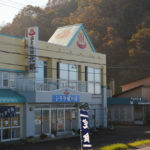 New Chitose Airport --> (Approximately 50 minutes by Plane) --> Memanbetsu Airport --> (Approximately 5 minutes on foot) --> Memanbetsu-kukou bus stop --> (Approximately 30 minutes by Abashiri bus [To Abashiri]) --> Abashiri bus terminal --> (Approximately 2 hours 10 minutes by East Hokkaido Express bus [To Monbetsu]) --> Monbestu garinko station bus stop *The express bus needs a reservation.